In the garden nematodes can be a blessing or a curse. Nematodes in compost are voracious eaters in natures great cafeteria. They consume bacteria and other invertebrates in the compost pile and help to prepare nitrogen for plant consumption. Compost nematodes also consume plant nematodes when they are together in soil. Plant nematodes are garden pests and a problem for many southern growers. Plant nematodes can be a real problem here in South Florida where our soil is sandy and calcareous. They invade plants roots growing there and creating blockages that are visible as growths called galls and are described as root knots. 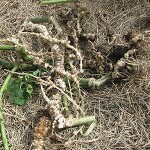 Root knot nematodes get in the way of healthy root function and can multiply in soil until they eventually destroy a crop. In the first year of your vegetable garden they won’t be there, but once vegetables have grown in your soil nematodes will be there. Some growers fumigate their soil with something that kills them. That’s not an organic solution. Other people solarize their soil. That is an organic solution, but it is necessary to turn the soil several times before covering it exposing soil to oxygen which releases nutrients and depletes the soil, and solarizing kills many organisms in the soil, not just plant nematodes. Nematodes are a family of worms of nearly a hundred thousand varieties. Some parasitize animals, like heart worms in dogs and cats. Some parasitize humans, like pin worms, hookworms, and whip worms. Others that we consider beneficial parasitize insects. The nematodes gardeners are most concerned with parasitize plants roots, but the majority of nematodes are not parasitic or harmful to plants, and some are beneficial. Soil that is rich in organic materials is less hospitable to plant nematodes and is an organic gardeners best defense against nematode infections. Rotating crop families is another important and effective defense against nematodes as well as other crop predators. Not all of the crops we grow are affected by nematodes. So rotating unaffected plants with plants that are susceptible is a prudent practice. Mustard greens are a resistant crop and planted in rotations with strawberries will help destroy the nematodes that would otherwise parasitize the strawberries. Some plants like collard greens may have some root knots showing after a full season of growth, but still produce lots of large delicious leaves. Most leafy green vegetables don’t seem to struggle with nematodes, and plants in the brassica family will generally help to reduce nematode populations in the soil. Some like oil radish, and rapeseed, can be planted as a green mulch and folded into the soil. When left in the soil to decompose during solarizing, or while the soil is fallow, brassicas are especially helpful in diminishing nematode populations in soil. Sesame is grown in rotations with peanuts, cotton and soy by Alabama farmers. Sesame is one of many plants that produce allelochemicals that function as nematode antagonists. Sesame oil and sesame cake are both sold as nematicides. You can find a sesame oil product called Dragon Fire at Arbico Organics. Neem cake, the cake left over after the neem oil is squeezed from the neem seeds can be mixed with soil to destroy nematodes. There are many other plants that produce chemicals that are used in organic nematicides including herbs like fennel, apple mint and spearmint. Sunflowers, tomatoes, potatoes, squash, and cucumbers will get nematodes, and once in your soil they will multiply. Repeating these crops in the same soil in consecutive seasons is a mistake. My friend Larry told me his okra had lots of root knot. When I inspected mine I found the same was true in my garden. Once I cut down the okra plants I am going to remove the infected roots from the garden and I will grow mustard greens and lettuce there along with some onions. Usually I leave finished crops’ roots in the soil to decompose, but this time and for now I take out the roots that are infested with nematodes and put them in a separate compost pile. I am on the fence about this practice. I reason that if soil organisms present during composting destroy plant nematodes then perhaps leaving the roots in the soil to break down does not necessarily ensure the survival of the nematodes once composting organisms get to the rotting roots. Some marigolds attract nematodes to themselves. Those marigolds once mature are removed from the garden to remove the nematodes they attracted. French Marigolds and African Marigolds which are common ornamental marigolds repel nematodes. Gardeners will plant them here and there throughout the garden, or rotate a whole season of marigolds in each bed where crops are grown alternately. Gaillardia pulchella, or Blanket Flower planted in the garden will help to repel nematodes as will Chrysanthemum and Black Eye Susan. These flowers can be effective against some plant parasitizing nematodes and not against others. Grasses don’t attract nematodes and so make an effective rotation after nematode attracting plants, and can be used as bio mass (organic matter) for the soil once you’re ready to compost, and replant. Some South Texas farmers found that certain high yield soy bean cultivars were resistant to nematodes and made effective rotations with cotton. I think it is important to point out that the roots of beans and peas will get nodes on them that should not be confused with root knots. Those nodes are nitrogen storage for legumes and can be easily differentiated from root knot because nodes can be easily flicked off of the roots of legumes, and often come off in the soil if those plants are pulled out of the ground. Nodes on legumes’ roots are desirable as they add nitrogen to the soil once they decompose. Root knot is generated from inside the roots of plants, and can not be detached from the root like nitrogen nodes can. There are more natural solutions to nematode problems in the vegetable garden than there are plant parasitizing nematodes. This ATTRA web page on nematodes is my favorite place for learning and resources on this issue. There you will find myriad solutions to nematode infestations as well as many preventative measures from which to choose. Wow, mind boggling how many things can go wrong in a vegetable garden! Thanks for the info! Thanks for letting me know a nematode is not a toad! You are a walking talking garden information center. Thanks for your comments Suzanne, Sara, Naomi and Daniel. Naomi I was not aiming at making gardening seem hopeless. The point I was hoping to make, and I guess I didn’t was that nemotode protection is just another good reason for composting and feeding your garden lots of organic material. Thanks for the wake up. I guess I better make a post about this. Hi, Adina. This is great information. If I want to go deeper, do you have any suggestions? I live in Monrovia, Liberia–very sandy soil by the ocean, very hot climate, and my tomatoes plants are infested (to say the least). Some don’t even bloom. The cherry varieties are doing a little better. I’m composting and will keep doing it. I’ll begin rotating, too, but I don’t have easy access to all the plants you suggest for rotation. I’ve just made a neem-based tea with garlic (for what that might be worth). But, I’d still like to try more ideas. Any suggestions are really welcome. Thanks! Hi Minga, Thanks for your comment. To address your question about wanting to go deeper I guess you mean you would like to learn more about nematodes. In the United States we have the cooperative extension and this service which is connected to the land grant colleges as well as the State and County Departments of Agriculture is available online. I often look for information from this system outside of my own state. I do google searches and read anything that comes up with a .edu in the URL. This is especially useful when learning about nematodes because they are an agricultural problem in many states, not just my own. Information from other coastal states like Mississippi, Alabama, Texas, Georgia, and Louisiana are most helpful to me. Perhaps in Liberia there is some sort of local support for agriculture. It is important that you find out what plants that are available to you for your garden are nematode repellant, or just resistant to nematodes. Those which prove effective are often strong smelling in the way that marigolds and chrysanthemum are, and may be very common and easily available where you live. It makes sense to me that the cherry varieties of tomatoes would do the best, they are in my state native plants and hardier against all pest attacks. If you can’t rotate plantings of resistant plants into your tomato garden then you will need to rest it from tomatoes and all plants that are hosts for nematodes. If you can afford to keep it fallow then pile on lots of organic material so that your garden becomes a compost pile for a couple of years. After that you should be able to try tomatoes there again for a season. With sandy soil, if you are growing plants that do not thrive in sand it is important to build the soil which means always adding organic material that will break down there. This has the added benefit of attracting beneficial nematodes that consume the root nematodes. In order to reap the benefit of the compost organisms that help keep nematodes at bay it is important not to disrupt the life of your soil by applying synthetic fertilizers or pesticides. Please look at the composting articles on the manuredepot blog. I write a whole lot about that, and it may help you too. Thanks again, and best of luck in your garden. Thanks Adina, for the information.I am doing research on root knot nematodes of okra and i want to know about chemicals that are used to control them. Hi Bina, thanks for your comment. I have noticed that root knot nematodes like my okra real well. I follow okra with brassicas in the fall. RK Nematodes do not care for brassicas. 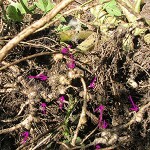 Some farmers plant oil radish (daikon radish) also a brassica, to repel nematodes, and other farmers in the south follow soy beans with a crop of sesame. Many commercial organic nematode repellants use sesame. Neem cake works well too as does Chitin, Chitin comes from crab shells, and it encourages the growth of fungi that consume chitin with an enzyme called chitinase. Chitinase digests chitin which is what makes up the eggs and shells of nematodes. Finally, if you keep good quality soil with lots of organic material in and on it the compost/soil nematodes, fungi, and other soil organisms that eat root knot nematodes will keep your infestations in balance. Good luck with your research. I hope when you say you are searching for chemicals you do not mean synthetic pesticides. Those sorts of solutions will damage soil organisms, and ultimately make you a slave to all sorts of synthetic pesticides and fertilizers as they systematically destroy the beneficial life in the soil making it unfit for plant life. Thank you very much for your help.God bless you. Now, I am totally confused as what to do about the grubs. What would you advise? My grub problem is out of control and nothing seem to work. Thanks. What do you think I could use for Grubs that actually work? What is your problem with grubs Sandi, and what is your culture around insect pests and disease right now? Great list of things to try but do any of them actually work effectively? I suspect most of it is good in theory or just plain myth and does not work in practice for the home gardener. Marco, Thanks for your question. None of this is mythology. I employ some of these practices in my home garden, and southern farmers are known to use sesame and soy rotations with cotton. I don’t bother with Marigolds because I am concerned that some may have allelopathic properties that disturb the growth of nearby crops. I have been growing on my land for over 24 years, and in that time I have never bothered with pesticides. I eat lots of good food from amazing lively soil and mostly all I do is feed organic matter to soil, plant seeds and harvest food. It really is that easy. I do follow crops like tomato, and okra with daikon radishes, and other brassicas. As for Seminole Pumpkin I know that had I left those pumpkin vines in my vegetable garden that fall I would have had lots of pumpkins in spite of the root knot nematodes. I just couldn’t leave it any longer I needed to start my fall crops. Now my Seminole pumpkins go outside of gardens in wilder areas where they climb and run and surprise me when their hidden fruits suddenly show up. The terrible myth that we have been taught is that we must do battle with nature in order to grow food in the garden. This just isn’t true, and it is proved every season in my garden and in the gardens of my clients, and in the gardens of many other gardeners who know what I know. I guarantee this is the easiest way to grow food in the home garden. Getting of the pesticide and fertilizers treadmill is the best thing you can do for your time management, your budget, and the ecosystem of your yard.